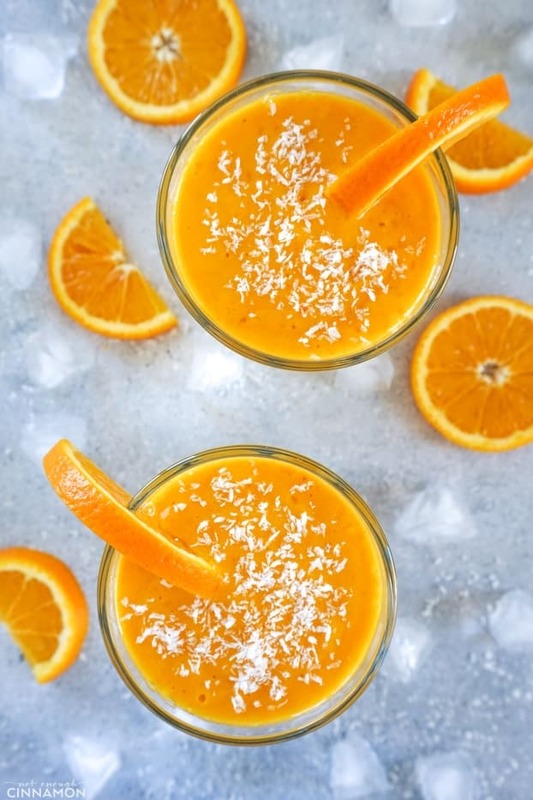 This amazing sunshine smoothie is not only delicious thanks to the mango, banana and orange combo; it’s also a nutrition powerhouse. It’s high in protein, it covers all of your daily Vitamin C needs and it’s anti-inflammatory + antioxidant thanks to the turmeric! This post is sponsored by iHerb and Nature’s Way. Of course, all opinions are my own and this yummy recipe is all yours. You guys, I’ve talked about my love for iHerb before (here!) and I’m super happy to partner with them again! iHerb is an online natural products store that sells everything from supplements to beauty products and of course, grocery products. This is where I buy my coconut oil, almond flour, protein bars, hair products, body oils and fish oil for instance… just to name a few! I’ve been using the site for years (like looong before they reached out to me!) because they have some of the most competitive prices and the shipping is always a breeze (I’ve tried it from 4 different countries now but they ship to over 160 countries – US and Canada included of course!). But let’s focus on this amazing smoothie first, shall we? Let’s talk a little bit about what’s inside this beauty! First, have you ever tried the combo mango + banana + orange? Well, it’s like taking an express trip to a beautiful and sunny tropical island (but without all the mosquitos and the humidity haha). In other words: it’s very delicious, sweet and it’s basically like liquid good-for-you candy. Nom nom nom. 1. 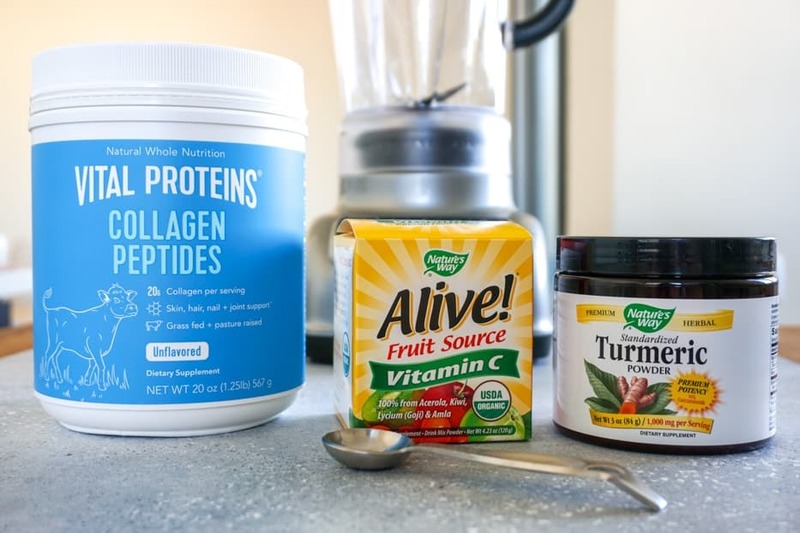 Standardized turmeric powder, for its natural anti-inflammatory and antioxidant properties – just to name a few (And also because it tastes fantastic in this smoothie!). Read below to learn why you should use standardized turmeric and not just any ground turmeric. I use the Vital Proteins brand and I absolutely love it because one serving contains 18 grams of protein (and 20 grams of collagen), it’s tasteless and it’s basically the only “protein powder” I can stomach (typical whey protein makes me gag – that’s how much I dislike the taste). 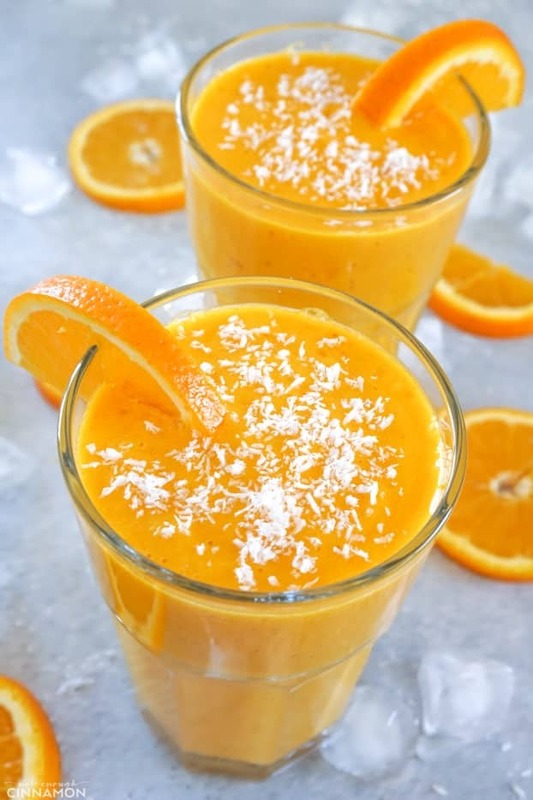 You can use it with hot or cold beverages (like this sunshine smoothie or coffee), add it to soups, sauces and baked goods. I try to incorporate two scoops in my diet every day! If you’re looking to up your protein intake and don’t like “normal” protein powder, this is a really great option (in addition to protein found in real food, of course). They also have a marine version, if you prefer. 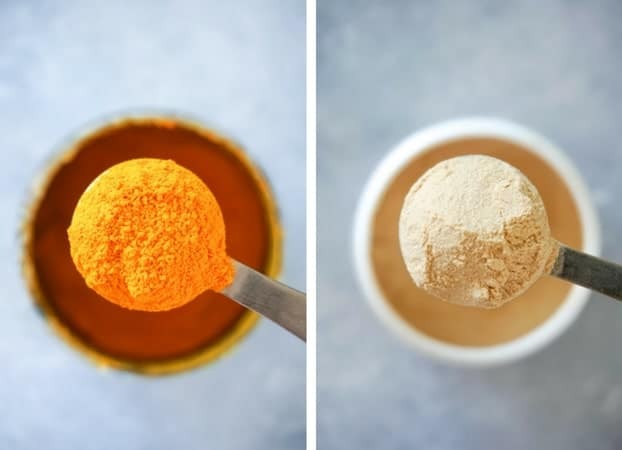 Now, you’ve probably heard about the great health benefits of turmeric, but did you know that you won’t actually reap those benefits by just using regular turmeric spice in your food? I know I didn’t! If you’re looking to experience the full health effect of curcumin, try using a turmeric powder/supplement that contains about 1 gram of curcuminoids per serving (like the Nature’s Way standardized turmeric powder I used for this recipe). It tastes just like regular turmeric, but on (natural) steroids! Well, honestly you guys, there’s nothing easier than making a smoothie, but layering the ingredients in the blender in a certain order can make the job easier for your machine. So let’s start! First add your frozen fruits: banana and mango. If you don’t have frozen fruits or if your blender isn’t strong enough to handle them, fresh fruits work too. It just won’t be as creamy. Then add fresh oranges, that you’ve peeled and cut in half or quarters. And finally, add all your powders: collagen peptides, vitamin C and turmeric extract. Get a discount on your Nature’s Way order AND new customers get an additional $5 off their $40 order on iHerb by clicking this link! 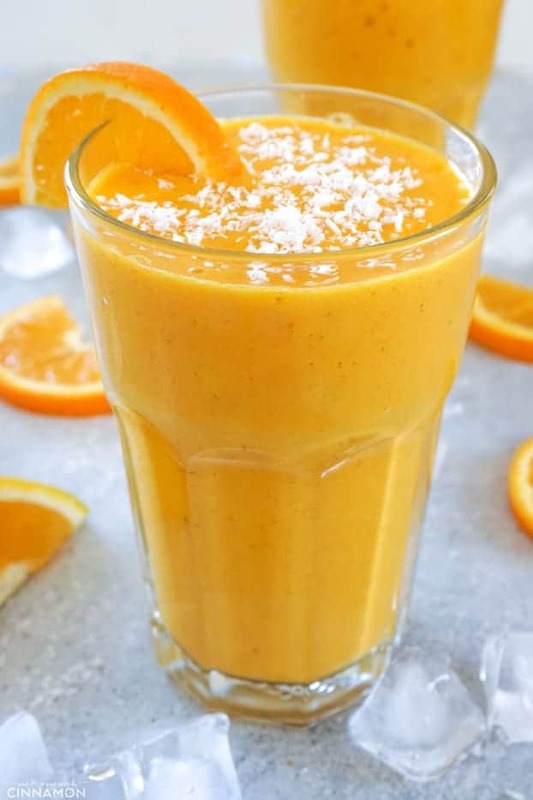 If you tried this sunshine smoothie, don’t forget to rate the recipe below and let me know how it went in the comments – I love hearing from you! You can also follow me on Instagram, Pinterest and Facebook for more deliciousness and behind-the-scenes! 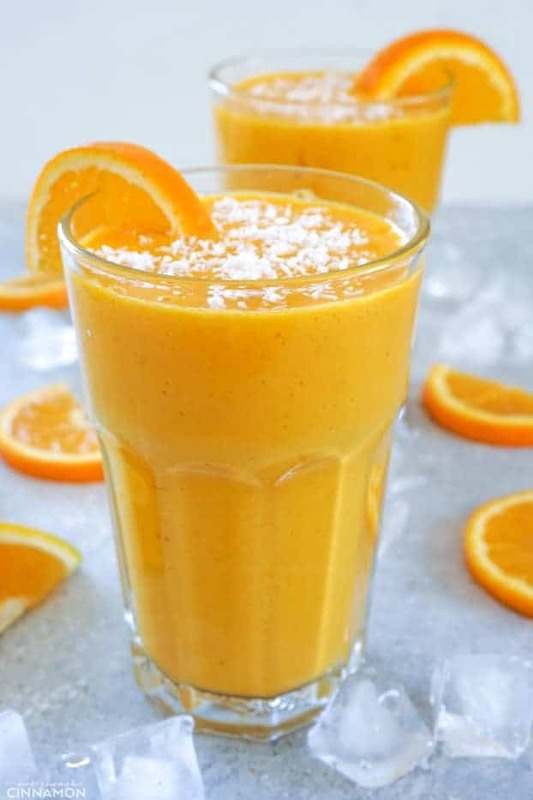 This amazing sunshine smoothie is not only delicious thanks to the mango, banana and orange combo; it's also a nutrition powerhouse. It's high in protein, it covers all of your daily Vitamin C needs and it's anti-inflammatory + antioxidant thanks to the turmeric! 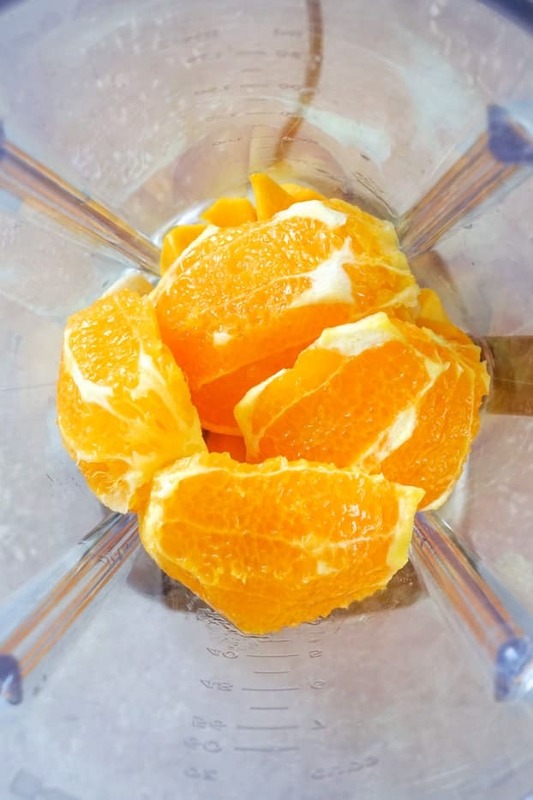 Add in that order to your blender: banana, mango and oranges. 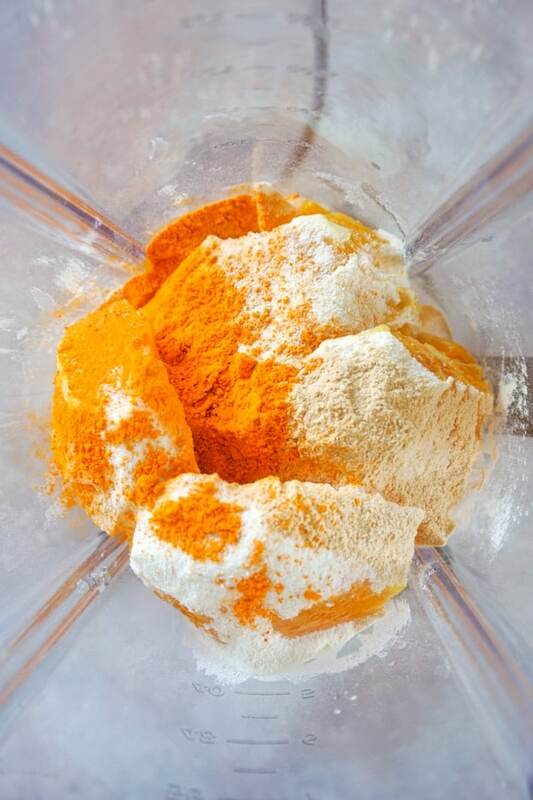 Then add turmeric powder, vitamin C powder and collagen peptides. Add water (or milk if using). Blend until very smooth and serve immediately. DO I NEED TO USE FROZEN FRUITS? CAN I USE FRESH FRUITS? Yes, you can use fresh fruits. 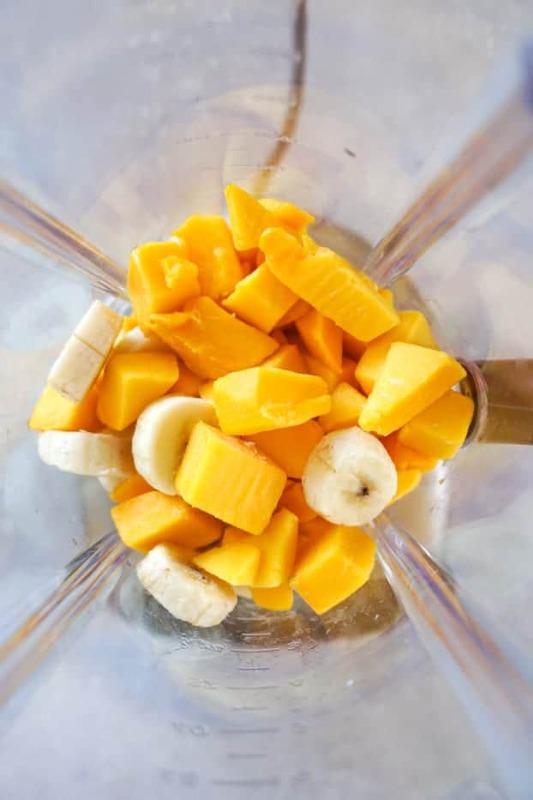 It works, but using frozen banana + mango gives a creamier texture to the smoothie. 1/2 cup rolled oats. Place the oats in the blender and process until finely ground. Then process with the rest of the recipe. If using oats and/or chia seeds, you might need to add a few tablespoons of water if you don't like thick smoothies. p.s. Don’t forget that you can get a discount on your Nature’s Way order AND that new customers get an additional $5 off their $40 order on iHerb by clicking this link! This would make the perfect afternoon pick me up. I have never put turmeric in my smoothies but this is a great idea. This smoothie would be such a great way to start the day! This would be a great pick me up after a workout! I’ve never tried the peptide powder or vitamin c powder before, but I’ll look for it in the store. I love adding turmeric to my smoothies! This looks so refreshing and nutritious – will definitely have to try! This looks like something I need to make STAT! So refreshing and healthy too!